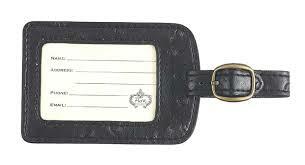 A luggage tag is a tag for your luggage that contains your personal information in case your bag gets lost. It should have your first and last name, your address, and your phone number. You don’t need to put all your personal information on it, especially not your social security or PIN number. Don’t get carried away. You just want your bag to get returned, not have your identity stolen. Luggage tags are often given away by corporations as a form of advertising because they want their brand and logo to be seen in airports around the world. You should never buy something if you can get it for free. And who really wants to waste money on a luggage tag? I’d rather buy a soda and a pack of Skittles. Or stamps. Or a little key chain that lights up. You can make your own luggage tag with a Post-it note and some Scotch Tape.